A federal grand jury in North Carolina is investigating allegations the controversial private security firm Blackwater illegally shipped assault weapons and silencers to Iraq, hidden in large sacks of dog food, ABCNews.com has learned. Under State Department rules, Blackwater is prohibited from using certain assault weapons and silencers in Iraq because they are considered “offensive” weapons inappropriate for Blackwater’s role as a private security firm protecting US diplomatic missions. “The only reason you need a silencer is if you want to assassinate someone,” said former CIA intelligence officer John Kiriakou, an ABC News consultant. Six Blackwater employees are under investigation by another federal grand jury, in Washington, D.C., in connection with the shooting deaths of at least 17 civilians in September 2007 at a Baghdad traffic circle. Prosecutors are expected to return indictments in the next few weeks, according to people familiar with the case. The investigation of the alleged dog food smuggling scheme began last year after two Blackwater employees were caught trying to sell stolen weapons in North Carolina. The two, Kenneth Cashwell and William “Max” Grumiaux pleaded guilty in February and became government witnesses, according to court documents. Two other former employees tell ABCNews.com they also witnessed the dog food smuggling operation. They say the weapons were actually hidden inside large sacks of dog food, packaged at company headquarters in North Carolina and sent to Iraq for the company’s 20 bomb-sniffing dogs. Larger items, including M-4 assault weapons, were secreted on shipping pallets surrounded by stacks of dog food bags, the former employees said. The entire pallet would be wrapped in cellophane shrink wrap, the former employees said, making it less likely US Customs inspectors would look too closely. In a statement, Blackwater did not address directly the allegations involving silencers but says “all firearms shipped to Iraq by Blackwater were given proper US government license.” The statement denied Blackwater owned or possessed any M4 weapons in Iraq. US Army officials told ABCNews.com earlier this year, at least one Blackwater M4 weapon was discovered during a raid on an suspected insurgent location in Iraq. Last year, a US Department of Commerce inspector at JFK airport in New York discovered a two-way radio hidden in a dog food sack being shipped by Blackwater to Iraq, according to people familiar with the incident. Blackwater says the radio did not need a license and was hidden among the dog food sacks, not inside the dog food. In addition to the grand jury investigation, Blackwater sources say the company is facing a multi-million dollar fine for some 900 instances in which it violated State Department licensing requirements for the export of certain weapons and technical know-how. Of the 900 cases, about 100 of them have been referred to the Department of Justice for possible criminal prosecution, according to lawyers briefed on the case. Last month, Blackwater hired a team of former federal law enforcement officials and defense experts that it said would review the company’s compliance with export laws. Despite four separate federal grand jury investigations of its operations, Blackwater’s contract to provide security services for the US State Department was renewed earlier this year. 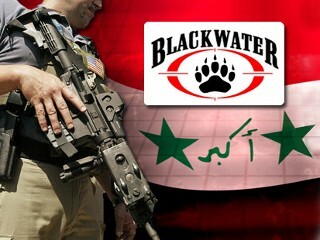 The contract pays Blackwater $250 million a year and runs for five years. This entry was posted in Crime & Corruption, Mercenaries, Order Out Of Chaos, Perpetual War. Bookmark the permalink. Why is it these so called investigators are worried about blackwaters weapons for.like it was stated it is a war over there.The tactics of the enemy may use any means that they can manage to think of.Blackwater should be allowed any weapon or equiptment so desired to preform there duties.I only could dream of working for such a company.If it is possible please contact me,but i feal i might of partied a little to much in my life that is recorded.I would love the opportunity to try and start over. Your comment just shows not only your ignorance of (or lack of concern over) Blackwater’s (Xe’s) criminal behavior, but of the causes of these hellish wars. Iraq being a campaign of massive deception about non-existent WMDs, and Afghanistan (now Pakistan) being 9/11, which was nothing more than a military psyop carried out by the US govt against its own people (like other psyops carried out by govt black ops terrorists: OKC, 1993 WTC bombing, the Bologna train station bombing, the 7/7 London Bombings, the 1999 Moscow bombings, etc among others). You are sick kp, if you seriously would want to work for Blackwater/Xe. By the way, your own sins, crimes and mistakes in life would be no obstacle to joining Blackwater which only wants sociopaths who enjoy killing. “the only reason for silencers are for assasinations” not exactly, Anyone who has fired a weapon from inside a small space such as inside a vehicle (like when protecting a VIP) will tell you that the muzzle blast WILL impair your hearing. A silencer is very neccesary, even the military has documented this by stating that the next weapon used by soldiers will be required to have the capability. Armored vehicles are like pressure vessels and the mere pressure of the shot being fired will burst your ear drums.